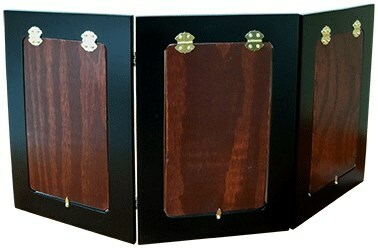 The magician shows a beautiful wooden three paneled screen. The screen is shown on both sides and is proven to be totally empty. The screen is folded into the shape of a triangle and a magical gesture is made. To the amazement of the audience the magician pulls out streamers, silks, flowers, even a 10 foot pole! The screen is shown on both sides once again to prove there are no hidden panels or trap doors. Panel Dimensions Approximately: 13.5" x 9.5" x .5"